The London Evening Standard has vowed to be a "force for good" if successful in its bid to be awarded the capital's first local TV contract next month. Speaking ahead of Ofcom announcing the winner of the licence in the coming weeks, Andy Mullins, managing director of the Evening Standard and national stablemate Independent, has underlined the media brand’s commitment and credentials for its bid, called London Live. He told Media Week: "We want to provide outstanding London orientated TV to all Londoners, both workers and residents, in a relevant, entertaining and informative format. It’s called ‘London Live’ because we believe breaking news, relevance and topicality are critical and we want and will encourage all Londoners from across the capital to engage and participate in our news and current affairs programming." Following on from the success of the Diamond Jubilee, and the 2012 London Olympics, he said the new London TV channel has the potential to build on the momentum and firmly establish itself as the world’s leading city. As an established media company, with international reach, Mullins stressed, "we can be trusted to deliver upon this great opportunity". 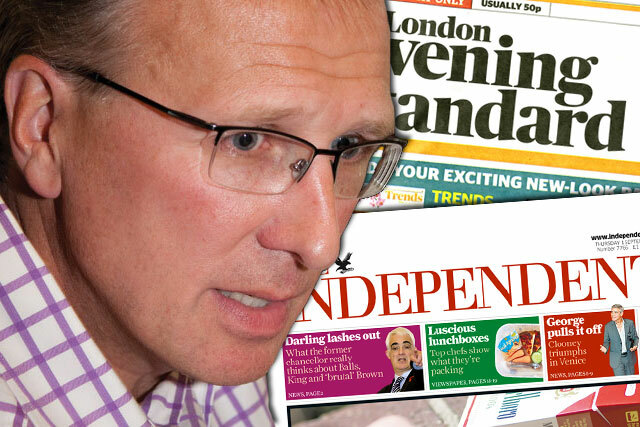 The managing director is part of an eight-person management board that has led the Standard’s bid, which also includes the paper's chairman, Evgeny Lebedev, and its editor, Sarah Sands. He believes Londoners are currently under-served in terms of news and current affairs and said London Live is ideally positioned to change this. "Londoners deserve better and we want reach out to all Londoners," he said. "We will make sure London Live is broadcast on all platforms available, including Freeview on Channel 8, Sky Channel 117 plus Virgin, Freesat, IPTV and Video on Demand. "We will also make sure its content and output is available across all platforms and formats: 33 IPTV local channels aligned to London boroughs to deliver granular local news; links from Evening Standard and Independent websites and content formatted for mobile and tablet." He added: "The news presentation style will be very different. It will have energy and pace. It will come live from the newsroom. Viewers will hear news as it’s created. They will see how stories are sourced and developed." If successful, much of London Live’s TV content will be generated from the existing newsroom of London's evening newspaper, creating a symbiotic relationship that has attracted support from Peter Bennett-Jones, formerly of production house Tiger Aspect, and the former Ofcom boss Stephen Carter. Mullins explained: "We will provide a minimum of four and half hours of London news, and one hour current affairs, a day with news bulletins every half hour. We will source local content from all across the capital from all communities and boroughs, as well as fully utilising the reporting resources of both the editorial teams of the London Evening Standard and The Independent." Last week, the Evening Standard’s 'Get London Reading' campaign won the inaugural London First Award for "improvement to Londoners’ quality of life". Hundreds of Standard readers signed-up to be volunteers to go into schools for three hours a week; trained by the campaign partners, Beanstalk. The campaign also received backing from London’s business community and the Mayor’s Fund for London, which collectively raised more than £1 million for the cause. Two years ago the Standard received Britain's foremost philanthropy award, the Beacon Prize, after raising £4.8 million for its 'Dispossessed Fund'. The fund helps tackle poverty by handing out grants to grassroots charities. Mullins believes such campaigns underline the Standard’s credentials for Ofcom’s first local TV contract in London. "We will be a force for good," he said. "We will push harder with our now famous campaigns, including the 'Dispossessed' and 'London’s Learning Ladder', to engage communities, key opinion formers and drive through real and needed change." London Live's application details plans to work with a wide range and diverse source of content partners across local communities and boroughs, educational establishments, arts and culture and local government and public services. Citing the BBC’s ongoing exodus to Salford, Mullins believes the set-up could become the preferred vehicle for key opinion formers and policy makers to voice and have their views and opinions heard. "We uniquely have the resources and editorial relationships to secure the relevance and quality of contributions that is required to make Local London TV a success," he said. "We alone have complete access to newspapers and digital platforms which will be vitally important for raising awareness for and driving audiences to our programmes. "Through the use of second screens and social media we will have the ability to encourage feedback, build and develop dialogue on critical issues and topics of relevance and interest and, if relevant, report back the following day in the newspaper. This will be unique to us amongst the bidding parties." The Evening Standard is one of five bidders in the running for London's new local television service, borne out of the newly elected coalition government as an initiative of the then culture secretary, Jeremy Hunt. The other contenders are London8, which boasts strong programme-making expertise, with ITV's former entertainment chief Paul Jackson and the entrepreneur and former Channel 4 chairman Luke Johnson on board. LondonTV, stresses its news credentials, with David Mannion (editor-in-chief of ITV News for 10 years) in the role of head of news, supported by journalists working for its three regional publishing backers: Archant, Tindle and Trinity Mirror. Made in London is chaired by the former BSkyB executive Ian West and supported by Time Out and Ambassador Theatre Group. It is promising to cater for the city's diverse population, including providing shows for the elderly and gay community. YourTV London, led by the former Conservative MP Steven Norris, is emphasising citizen journalism, of London's sporting and cultural events. There still remains widespread uncertainty about the commercial potential of a local London TV station. Richard Oliver, managing partner of investment at media agency UM, cautioned that previous attempts to run local TV channels, notably Channel M in Manchester, have ultimately failed to gain traction with both viewers and advertisers to sustain it. He warned that there did not appear to be any immediate demand from advertisers for a local TV network in London prior to the Government’s local TV announcement. However, Oliver added that if any local TV initiative is going to work in the country, London, with its population of more than seven million and thriving business hub, should be the place to make it happen. The capital also has the added advantage of being a defined region – meaning that viewing figures can be provided by Barb, if the successful bidder is willing to pay for the service. His personal instinct is that a local news-led operation will guarantee more viewers than the entertainment-led concepts, but other commentators have warned that the established news giants BBC and Sky already have a heavy London bent. In total, Ofcom is awarding 21 local TV licences around the country, with the London bid expected to be announced by the end of February.